This historic self contained accommodation is only 30 metres from the Moyne River. And an easy walk to most Port fairy attractions. The property runs from Gipps Street through to the Moyne River . 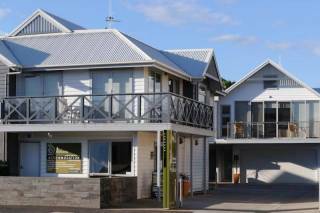 With a modern apartment on the River side, and the Historic cottage on the Gipps St side. A shaded courtyard in the center joins the two property's. 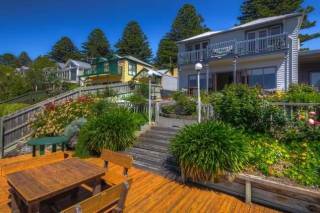 The Historic Moyne River Cottage is a two-bedroom historic cottage fronting Gipps Street, nestled among Norfolk Island pines over 150 years old. Enjoy sitting on a sun-drenched front or back veranda or by the cosy gas log fire in the sitting room. Riverview Cottage is one of Port Fairy's original riverside (facing Gipps Street not the river) homes dating back to the mid 1800s. 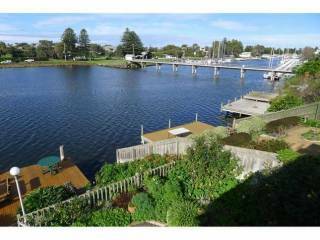 It is tranquil, romantic, luxurious and a stone's throw from the wharf, Griffith Island and Port Fairy's historic township. A credit card payment for the total amount is required at the time of booking. We will process a charge against your credit card and send confirmation to the email address supplied. Changes and cancellations for stays during high season must be made more than 60 days prior to arrival. If a cancellation is within 60 days of arrival and if accommodation can be onsold then a refund will be issued, less an administration fee. Cancellations at other times can be made up to 30 days prior to arrival and will be subject to an administration fee Special requests are on request basis only and are not guaranteed at the time of booking.Check out time is 10am. Late check outs can be arranged at an extra charge where available. Check in time is from 3pm. May cause damage to the property. We reserve the right to eject guests from the Cottage who are deemed by management to be behaving in a socially unacceptable way; causing damage; disturbing other guests; using unacceptable language or otherwise breaking Management Rules. No Cancellations or Changes Cancellations or changes to bookings for this Property will not be permitted for any reason. Once confirmed a booking cannot be refunded or altered in any way.